Pumpkin men armed with swords and teeth haunt Le manoir de la Peur ! by Nayntoh@Brisesol, EU. October was the month of hauntings, at least at my place. Strangely flickering lights, power failures, blurry vision, exploding ovens. I’m haunted by a poltergeist! I’ve replaced my oven, my glasses, several light bulbs, internet cables and, after a series of odd power blackouts, the house fuse. Of all of these, the oven was the hardest to fix. I spent many days and take-away meals researching the new-fangled technology that comprises the modern stove. Both the stove and the house fuse were over 50 years old. I suppose, after that long, they deserve an early retirement. For other people, October means spooky, creepy, spidery and orange. 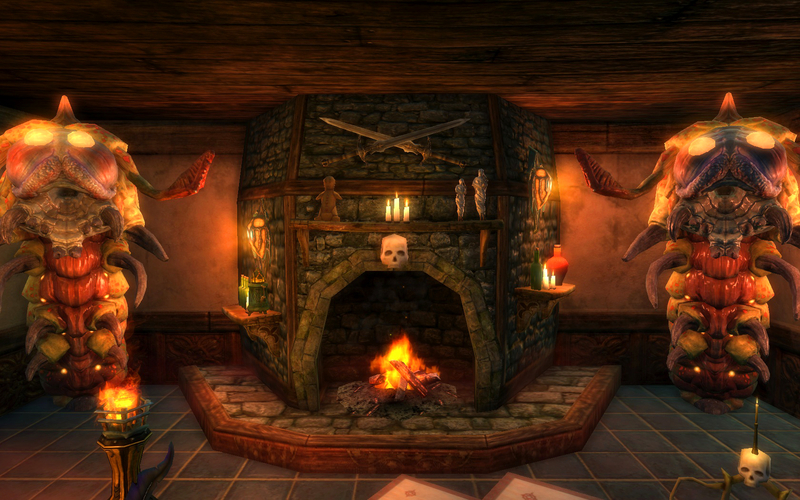 I wondered what scary themes people are building in the newly released Deepwood Cottage, so I toured the shards, looking for the best representations of Halloween. Halloween scene of a ride-by decapitation. 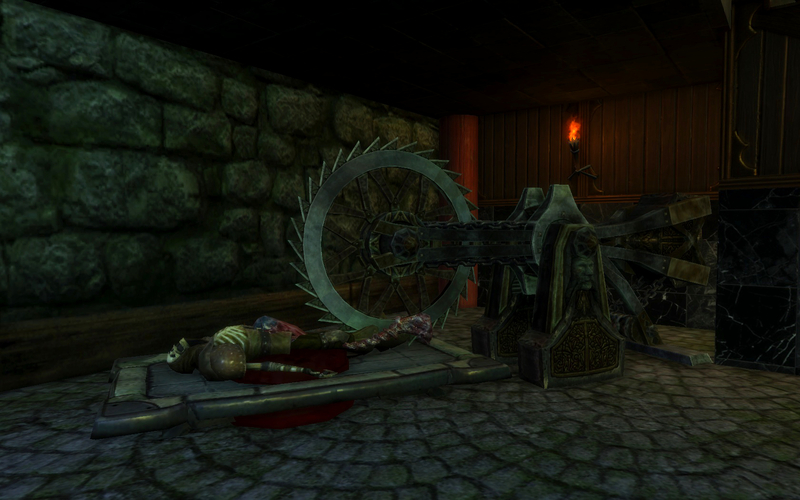 Built by thestylishradish for Hammerknell Haven by Consortium@Zaviel, EU. 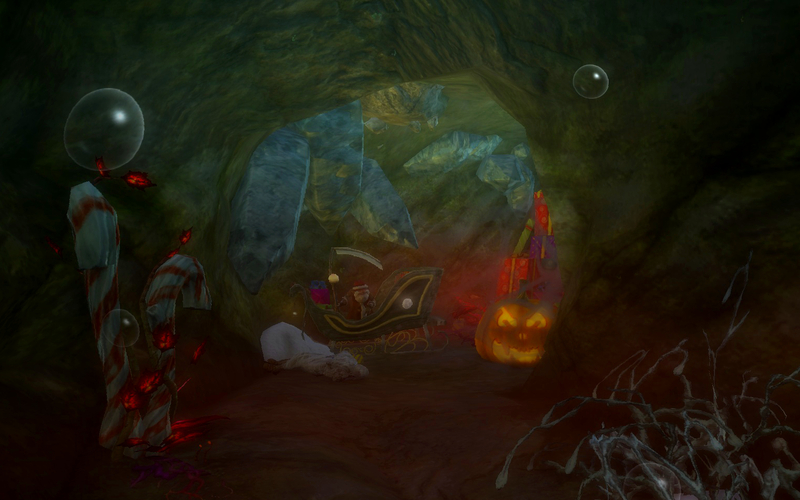 One thing I noticed on my tour is that few Halloween dimensions are completed. It seems builders had to choose between building the dimension or farming Autumn Harvest currency to buy dimension goodies. That’s a shame, I saw many dimensions with one good idea and hundreds of item count left. We’ll have to wait till next year to see the true power of Halloween. The most welcome and versatile item Autumn Harvest has bought us is the humble pumpkin. 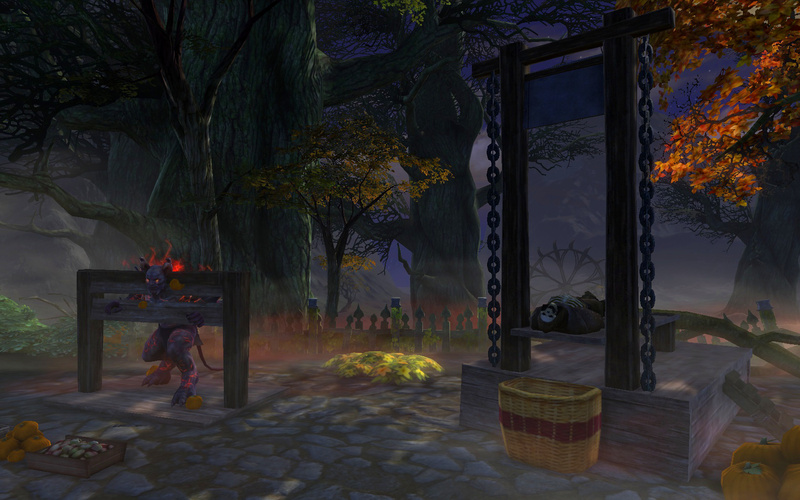 I’m sure the large, round and small pumpkins will find their way into kitchens across Telara. 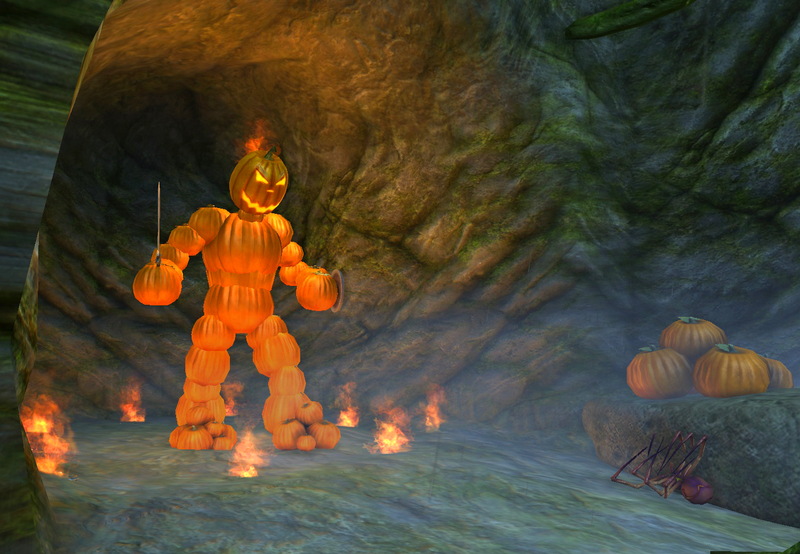 Nayntoh at Brisesol has been having fun with pumpkins, building a rampaging pumpkin man with a jack o’lantern head. Wall art made with human skulls, giant ribcages and spider webs. Galerie des Schreckens by Risanne@Brutwacht, EU. The jack o’lanterns scream Halloween but their ability to produce various coloured fogs will see them used all year round. 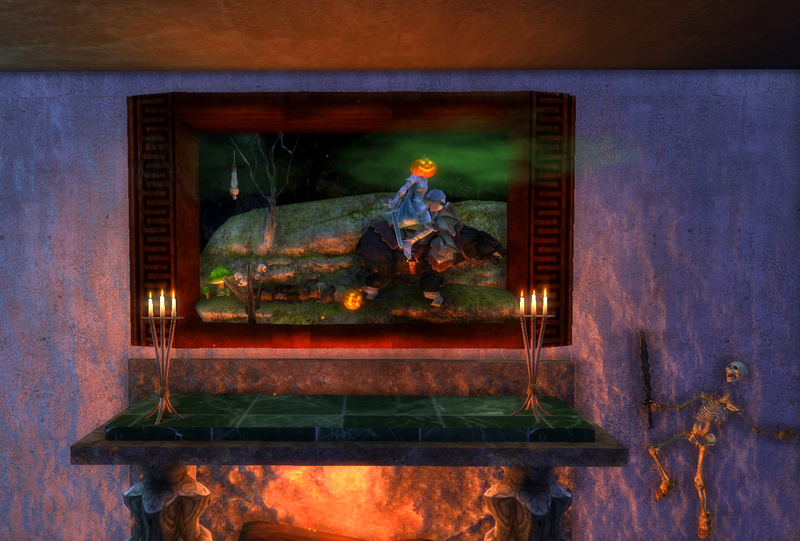 I played with the sly jack o’lantern with green fog for a Halloween picture in Hammerknell Haven, the dimension I’m building for Consortium on Zaviel (now open for viewing}. I love the way the fog spills out of the picture. Nor am I the only one painting pictures. Risanne has created a gallery of horrors on Brutwacht, (Galerie des Schreckens by Risanne). Her painting, made with skulls, rib cages and spiderwebs has a decidedly modern feel. 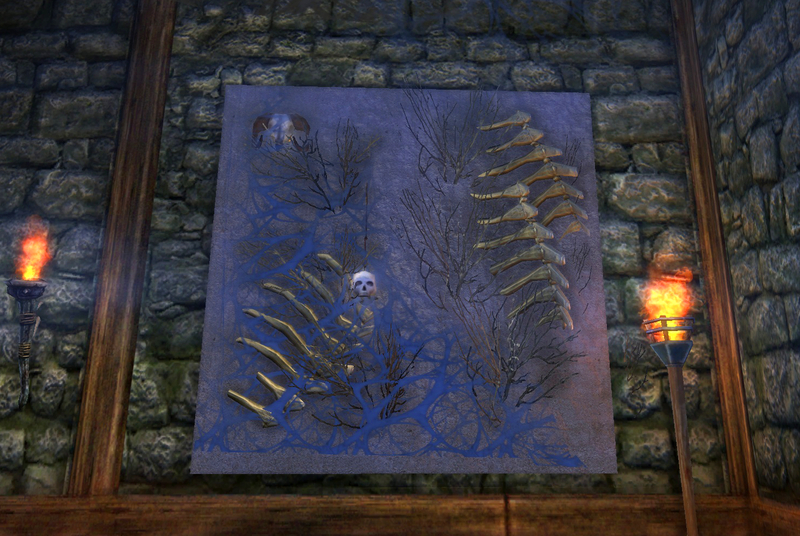 Paintings do not need to be complex to make an impact on the viewer, some skulls, a wrought iron fence and a jack o’lantern evoke memories of scary movies and haunted houses from our childhood; at least, that’s what Aslaug’s simple painting does for me (The Halloween House by Aslaug@Deepwood ). Whack a stick on a skeleton, add a dash of jack o’lantern for this fun decoration. Gothika by Ultra@Zaviel, EU. 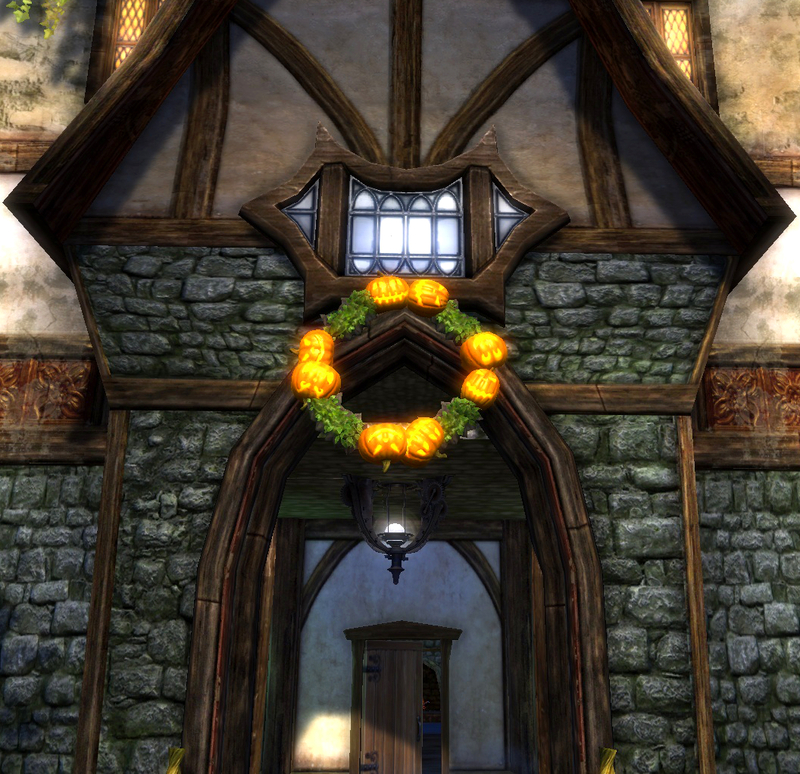 Making wreaths is a traditional handicraft and Rosalean winds boggling leaf beds between jack o’lantern accents to hang over the door of her cottage (Evergreen Cottage@Gelidra). 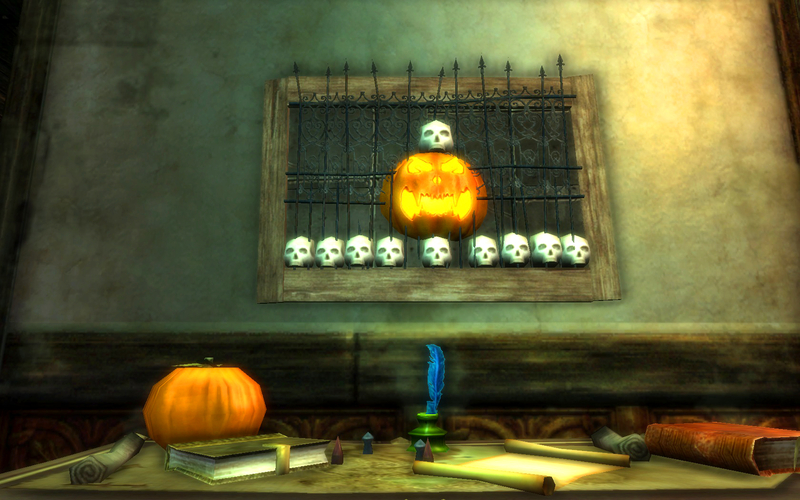 Ultra (Gothika@Zaviel) makes another simple decoration by combining a skeleton, a broom and a jack o’lantern for a flying treat. Gothica is a fun little dimension, still half completed but has some nice scenes of gruesome horror and shows just how flexible a rogue’s skeleton can be. You can chop off their heads or hang a dead rogue high and it’s still a good looking corpse. 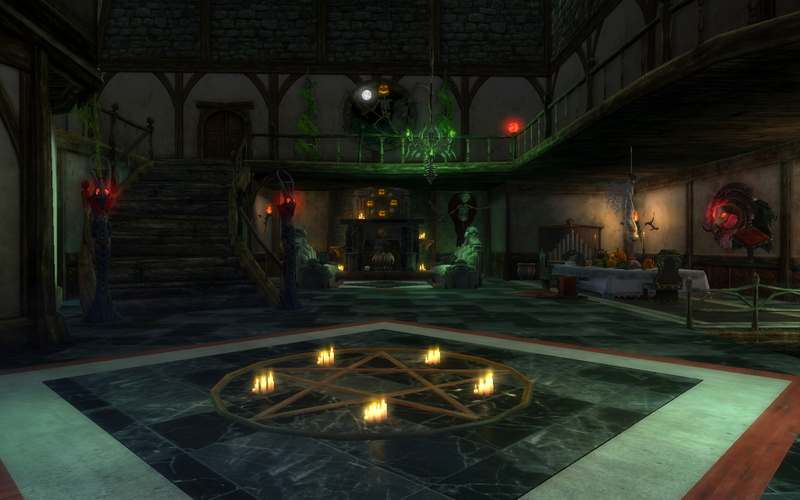 While you’re touring Zaviel, take a look at Horror House by Rali. While pumpkins and skulls still feature in this dimension, Rali takes an understated approach to decorating for Halloween. Less playful, more elegant, Rali has made a spooky couch out of gravestones and skulls and dressed the dining table in food more likely to eat you than the other way round. One of my favourite dimensions. Some dimensions are more about the exploration than the decoration. 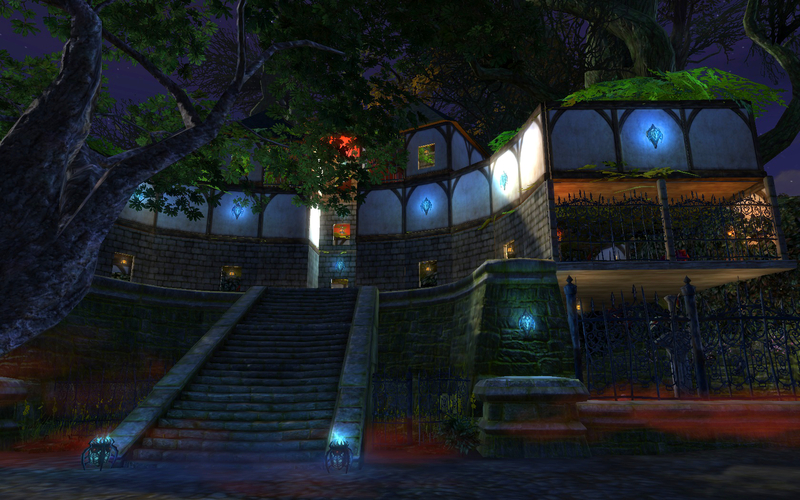 Hebe’s Haunted Maze (by Hebetrix@Faeblight) will take the visitor on a trip around Deepwood Cottage, filled with little scenes of horror. Find Santa Lair (by Hazril@Bloodiron) is a similar idea, less mazy, more explore till you find Santa. Both will offer the appropriate 10 minutes of fun for your efforts. Atchung Hexenfalle by Ruana@Brutwacht , combines great decoration with exploration. Not only has Ruana made Deepwood Cottage the hang out for the local witch coven, they’ve also built a ruined house to explore. Just be careful not to fall down any holes whilst wandering around this dimension. 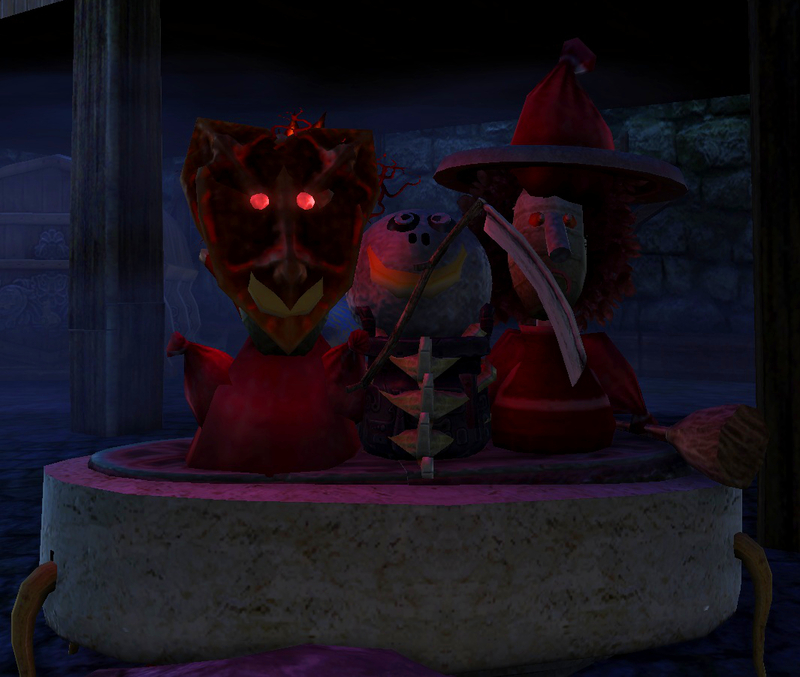 The one must see dimension this Halloween is Nightmare Before Christmas by Celestee@Deepwood, based on the animated movie of the same name. Celestee has recreated some of the characters and scenes from this much loved show. It’s the best example of morphing I’ve seen in a while. Go wandering in the cottage grounds to find the tree into Christmas. 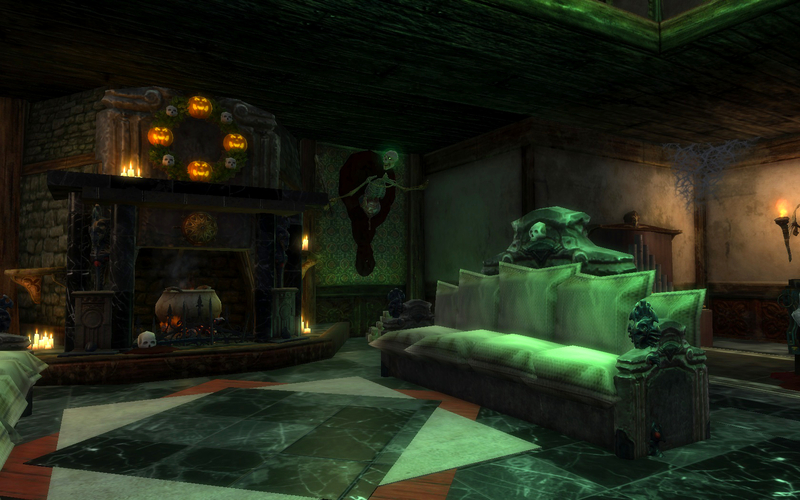 Spiders and webs, pumpkins and fog, corpses and skulls are the language of Halloween this year in Rift. 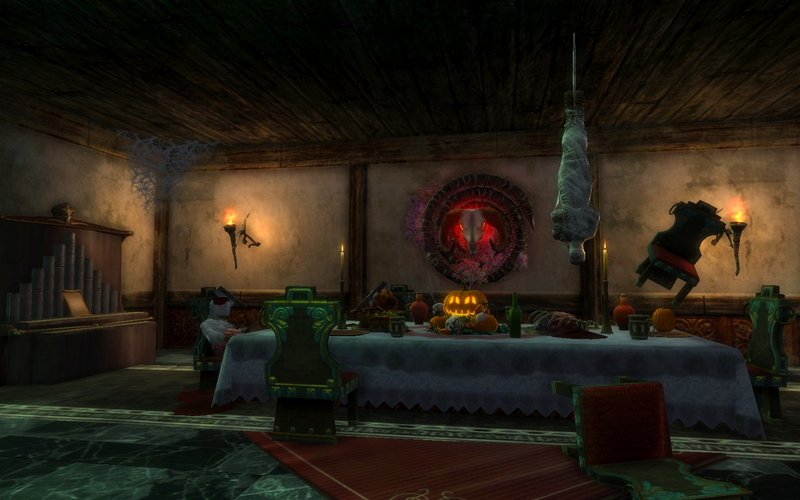 All of them fit beautifully in Deepwood Cottage, home of the witch of Gloamwood. 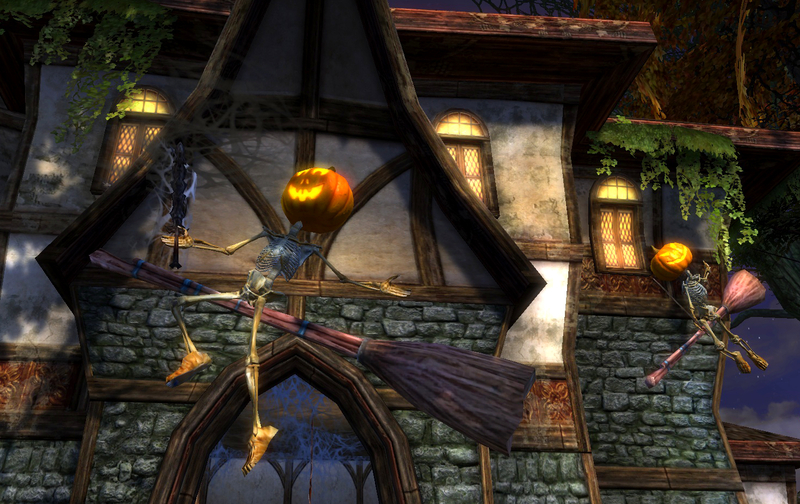 Trion have given us so many treats, this Halloween and very few tricks. Let’s hope Fae Yule is as good. 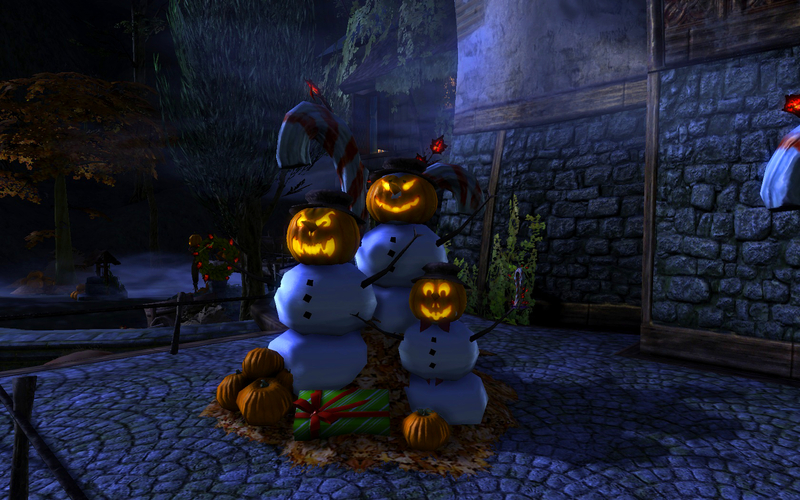 What do you get when you cross a jack o’lantern and a snowman? 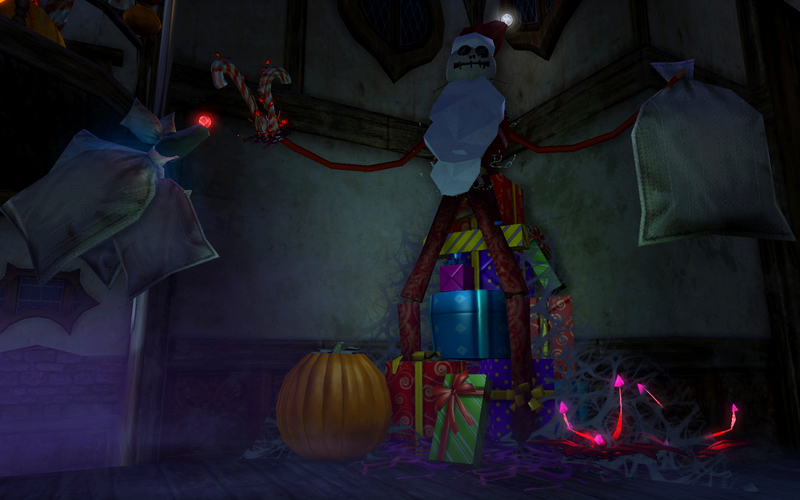 Visit Nightmare Before Christmas and see. By Celestee@Deepwood, NA. Santa never looked so elongated. Nightmare Before Christmas by Celestee@Deepwood, NA. Christmas trick or treating. Nightmare Before Christmas by Celestee@Deepwood, NA. Jack o’lanterns and bogling leaf beds make this wreath for Halloween. Evergreen Cottage by Rosalean@Gelidra, EU. Use number 12 for a rogue’s skeleton. Gothika by Ultra@Zaviel, EU. Fire place and attendants at Atchung Hexenfalle by Ruana@Brutwacht, EU. What do witches get up to on Halloween? find out in this ruined cottage by Atchung Hexenfalle by Ruana@Brutwacht, EU.